The expansion valve is placed at the evaporator inlet tube. The expansion valve is used to control refrigerant flow into the evaporator. Excessive refrigerant flow into the evaporator can cause evaporator flooding, which can result in diminished air conditioning performance and possible compressor damage. Too little refrigerant flow can cause evaporator icing or diminished air conditioning performance. The expansion valve contains a variable orifice that is controlled by a sensing bulb placed inside the evaporator cooling fins. The sensing bulb is a sealed tube containing a small amount of refrigerant. 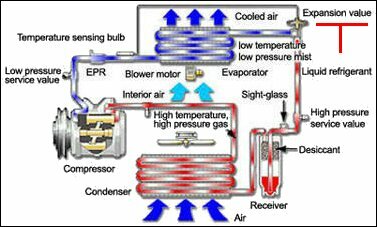 The changes in temperature of the evaporator cause the refrigerant inside the sensing bulb to expand or contract. The action of the internal pressure of the sensing bulb controls the amount of refrigerant that flows through the expansion valve by varying the size of the orifice. Expansion valves are used more often in air conditioning systems equipped in imported and older domestic vehicles. The systems can be identified by use of a receiver drier in the high pressure line of the air conditioning system, between the condenser and the expansion valve. Refer to an auto repair manual for accurate diagnostic flow charts covering your automobile’s A/C system. 4 Comments on "Ac Expansion Valve"
My low pressure side turn hot to after I drive in the city. If I drive highway miles then it stays cool. The city driving will turn my cool air into warm the hot. My air stays cool if I stay on the highway, if I insulate the low pressure side help me keep the air cool? What would you suggest I do to repair my problem? My AC gauge reading is 30 (erratic +10psi once in a while with 1 second intervals) on the low and 170 on the high side. No coolness on the evaporator. Just finished extracting old freon and vacuum to -30psi for 20 minutes and added synthetic oil after. And also added refrigerant 134A but no success. What cold possibly went wrong? Expansion valve needs to be replaced? Or something else? Your earliest reply is highly appreciated.